It happens often that a single investment case gives rise to several proceedings in both, international and domestic jurisdictions. These multiple proceedings might be parallel or successive, and might lead to contradictory rulings, double condemnations and even to some cases of deny of justice. 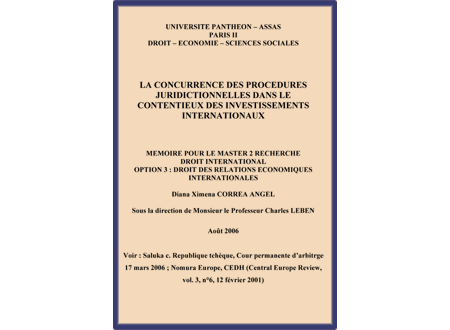 In this dissertation, this discussion is deeply analyzed, as well as some legal proposals are formulated in order to avoid or to deal this jurisdictional conflict.